As you can see below there a lot of muscle groups in the neck. 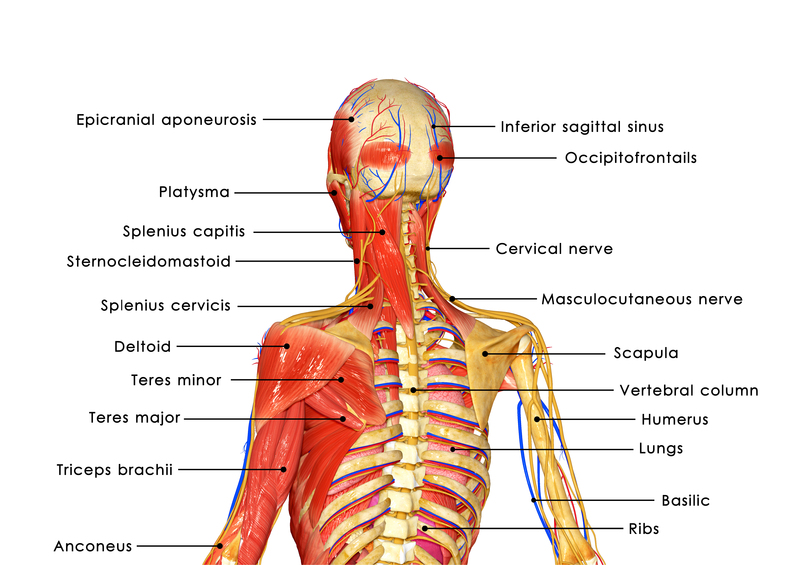 We, as osteopaths, spend years studying so we know the attachments and actions of all muscles so we can be precise and effective in our treatments. Knowing the actions of the muscles of the neck we can ask you to contract and engage the target muscle so that it palpably hardens and is easy to identify. This way we know the exact position and depth of the target tissue. 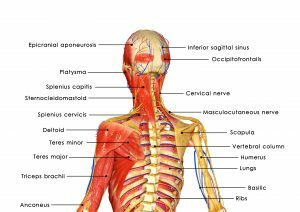 There are many muscles in the head and neck anatomy (in excess of 80-90 pairs of muscles if you include the soft palate, tongue, pharynx, larynx, nose and throat). They all are have vital tasks, including movement of the head and neck, chewing and swallowing, speech and facial expressions. 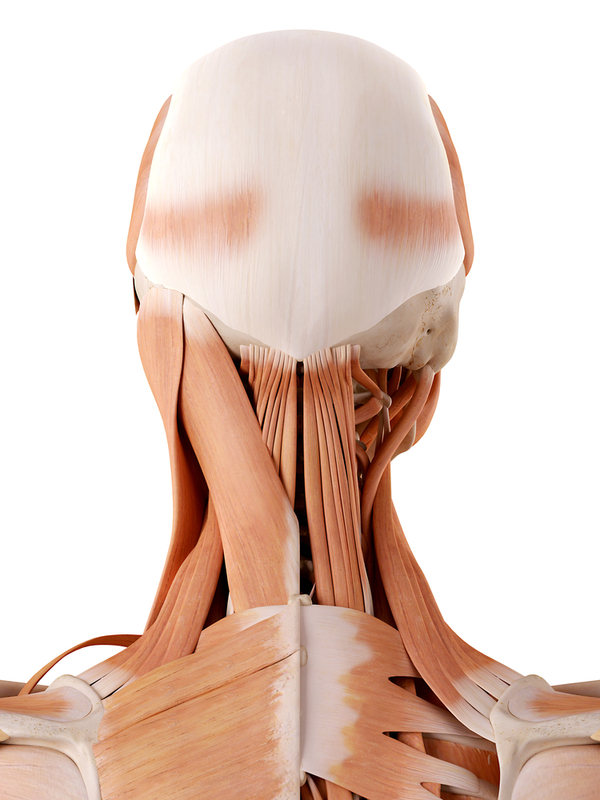 The neck muscles, including the big muscles like sternocleidomastoid and the trapezius are responsible for the gross motor movement in the muscular system of the head and neck. They move the head in every direction, pulling the skull and jaw towards the shoulders, spine, and scapula. Generally, these muscles exist on both left and right sides of the body and control the flexion and extension of the head and neck. Working individually, these muscles rotate the head or flex the neck laterally to the left or right. In the modern workplace environment, we can expose ourselves to long periods of postural strain that impose heavy loads on arms, shoulders and neck. This can either be comprised of either spending long hours on a computer or behind the wheel of a car. Although we may be initially unaware of the effects this will lead to an increase in soft tissue tension in the neck and shoulders especially. Eventually you can experience mild discomfort but when you have finished work your symptoms will improve. This is the first stage of symptoms and may last for several weeks or longer. If nothing is done, the symptoms of RSI are likely to exacerbate, intensify and last longer. Without treatment, the symptoms of RSI can become constant. At this stage the condition may be irreversible. An osteopath can help suggest simple modifications to your workplace. Gentle massage to the tight muscles and manipulation to loosen the joints of the neck, thorax and back can relieve the build-up of muscular tension that may over time lead to headaches. 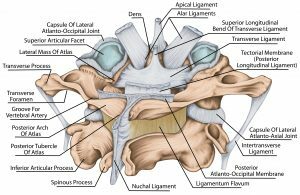 The purpose of ligaments is to act like rubber bands and restrict excessive movement in the neck in flexion, extension and rotation (the word ligament comes Latin ‘ligature’ meaning bind or tie). Therefore, in the event of a road traffic injury these are the structures most often injured. 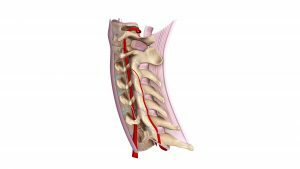 The major ligaments of the neck are the nuchal ligament, interspinous ligaments, fibrous capsules of the joints (or facet joints) in the neck that serve to limit your movements, and posterior longitudinal ligament and the anterior longitudinal ligament. In the event of a road traffic accident (RTA) the prognosis is usually good and most often there is no permanent damage. 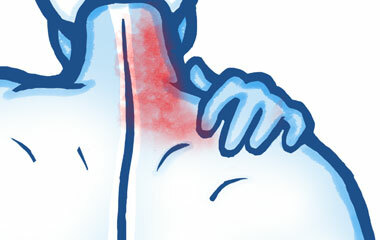 Sometimes aches and pains can persist but it does not always indicate that it is serious. An RTA usually affects the muscles that determine our overall physiological range of movement. The facet joints in the neck, responsible for helping to control rotation, are also usually be affected. It is also possible to get sensations in the arm caused by minor nerve root irritation. Chest pains can result from a seatbelt running across your chest and it is not uncommon to also experience lower back pains as well. 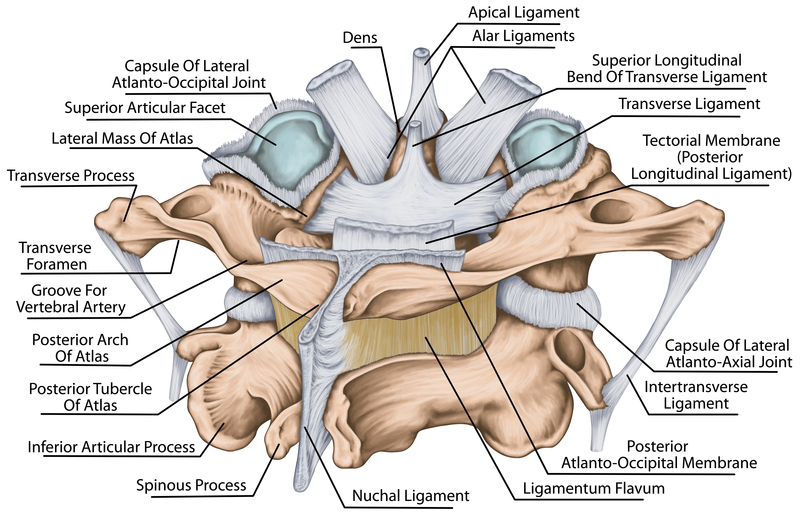 Previously we described a ligament as a tough band of tissue that restricts excessive movement and connects two bones. 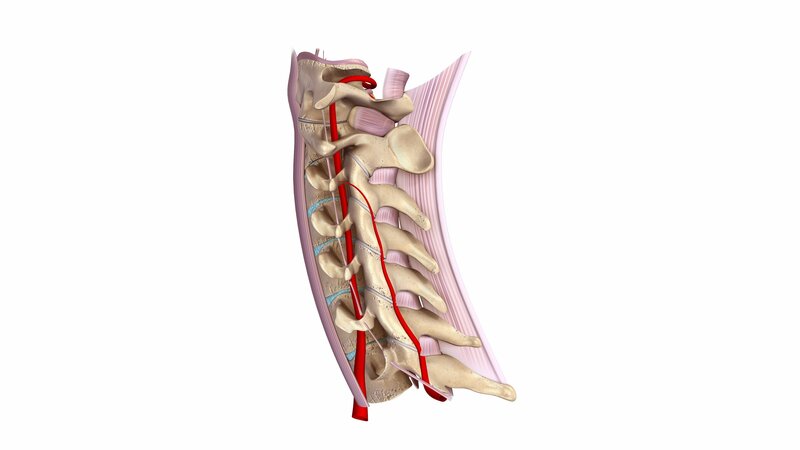 The spinal ligaments obviously connect the vertebrae of the spine together and provide stability for posture and spinal movement of our necks. One of the most significant ligaments is the ligamentum flavum (flavum means yellow and this is really is the colour of this specific ligament). 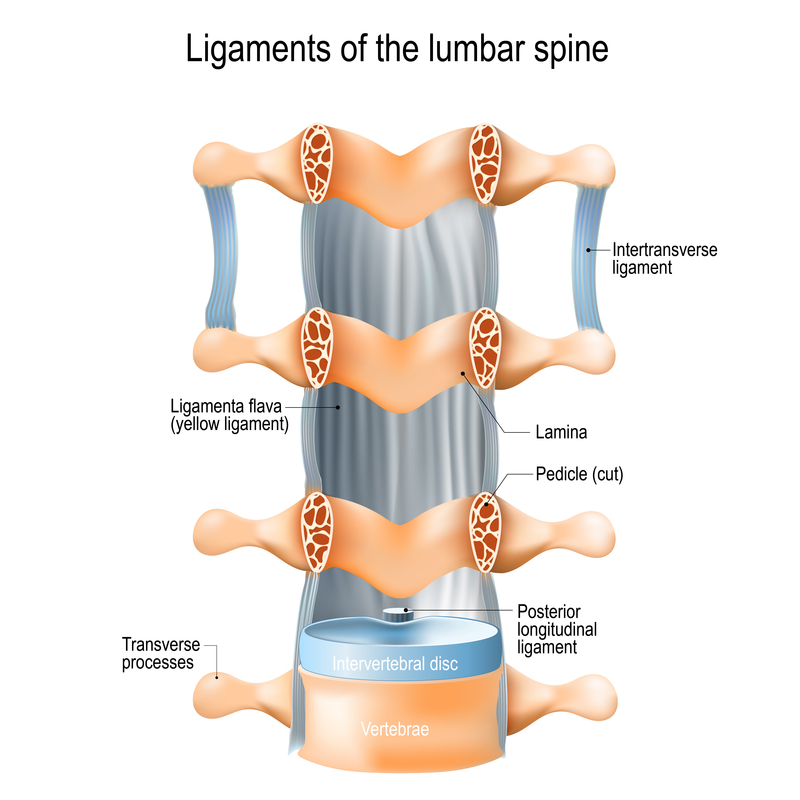 The ligamentum flavum is a short but thick ligament that connects vertebrae together. Its elasticity serves to preserve our upright posture. This degeneration can happen at any level of the spine but is most commonly experienced in the lumbar (lower back) and cervical (neck) regions.